Go ahead and click here. If you need help converting from Euros to any other currency, click here to find out just how much these things are going for. What are those fuzzy things in all those gaudy colours?? I don’t even know what those puffs are??!? Fuzz balls? There are some pretty hideous ponchos out there but this one really is an abomination… why would you put puffs on your poncho? Not to mention that the yarn looks really cheap too… It looks like a thread yarn of some type that should only be used for doilies. This is an actual pattern booklet too… love the title “Poncho Pizazz”… ya, ponchos with extra-large fuzz balls on them really are quite pizazzy. Yikes! 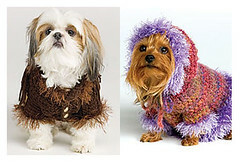 I thought the Doggy Martha Ponchos were bad but these ones… hmmmmm… sheesh! Why would you want to put a furry jacket on your dog? That one is beyond my comprehension!!! Just because you can, doesn’t mean you should! I feel a little bad for these guys…they are not looking so happy wearing these jackets! And the one with the hood…ya, it’s a great idea to cover up your dog’s ears… after all, I’m sure they prefer muffled sounds!! I bet when the shoot was over they were pawing at these jackets trying to get them off!! Why would you want to do this? Inflict such horror on your son? If that’s her son that is…but the assumption is there that’s for sure! The hats are so bad and then to act like you’re all in love because you have “matching” hats??!! Oh dear! 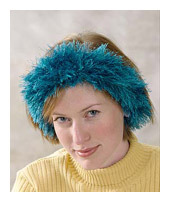 What exactly IS hanging off the back of her hat anyways?? 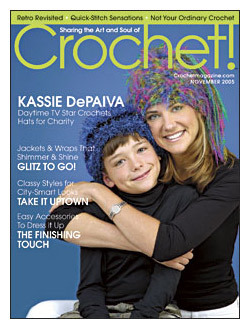 I have no problem with making matching hats because it’s your son and you love him, but come on, make him something at least slightly masculine and make something for yourself that matches nicely without strands of yarn hanging off the back like you forgot to sew in your ends!! If the title is right that it’s hats for charity, oh my, come on again…give people something nice if you’re going to give it to them as a gift. Yikes…what do they think? Just because it’s a charity hat, people will want to wear hideous monstrosities and be all happy about it?? Why would anyone want to crochet themselves their own necklace and call it jewellery when you have such gorgeous materials out there like gold and silver to wear??? Seriously, why? This does not look nice or pretty nor does it compliment her outfit. Why I ask?? Why??? I don’t have much more to say about this as I think the picture says it all. Ugh! And using yarn that is “gold” coloured won’t make it any better either…just look at the close-up if you’re unsure. I don’t know about you but I seriously love any clothing article that stretches a good 8 inches around my hips. The bust, however, is 32″ without any stretch so hey, no room for growth there but no problem, my hips tend to grow without my chest growing anyways…makes total sense…NOT! I am not even going to “go there” on the model’s stance for this dress…it’s bordering on crude and is she standing that way to make sure it doesn’t slip off? I mean, really, it has so much “give” in the hips, how does it stay on? You like it? Great, go buy it for $160 US – metallic purple fringe sure is a girl’s best friend! 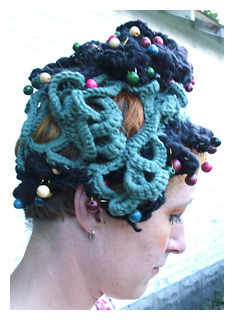 Anyone want to look like Medusa? Go ahead then, get this hat! It only retails for $77 US and for such a small amount of money, seriously, who wouldn’t want to? Can’t remember who Medusa is? Go ahead and click here! I think I’ve turned to stone already! But then again, what am I saying?? 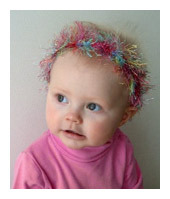 Maybe you want to wear the latest “worm” chic on your head and this hat will do just fine to achieve that look too! Oh my! Someone please call PETA! This has to qualify as unethical treatment of an animal! If I was walking down the street and saw someone with a dog with a Martha poncho on them, I’d seriously have to think about shooting the owner…why, why, why would you submit your animal to such distress? I won’t even touch on the hideous colours chosen for these dogs or the red bow but when you first look at the picture, you really have to wonder just what the h*ll you are looking at! Do you think these dogs could walk while wearing these? I can see the dog’s paws catching in the poncho so easily and then we’d have doggy pile-up! That would have to qualify as cruel for sure! 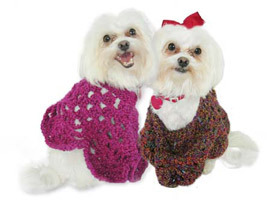 The proliferation of the Martha poncho is incessant…how can you put it on a dog? What’s next? A gerbil? A hamster? A cow? A horse? Come on!! This one really takes the cake! Both models seem to have that shocked look in their eyes too…I’m sure the baby is thinking, Mommy, why?? whyyyyyyyyy?? ?